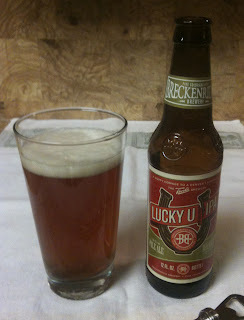 And another IPA - a Lucky U IPA from Breckenridge Brewery. 6.2% ABV in a twelve ounce bottle. Their web site shows 68 IBUs. This IPA pours with a light to medium head. Another one with a color of golden honey, with a little orange tint to darken it up. Aroma is fairly mild, and of citrus. I would say this is a medium in strength, maybe a little milder. I am getting mostly malt on the taste, with a smaller amount of hops & citrus. The aftertaste leaves you with that grapefruity citrus fading into some bitterness. 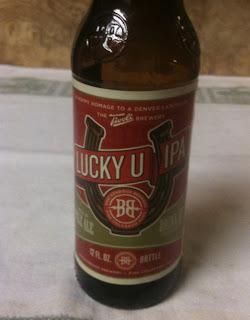 This is another IPA with a nice maltiness, and not so much of a focus on hops.